Embraceware Software has announced the release of Shuttle Scuttle 1.0 for Mac in the Mac App Store for just $1.99. If you prefer mobile gaming, Shuttle Scuttle is also available for iOS devices on the iTunes App store for the holiday sale price of just 99 cents USD (regular price is $1.99). 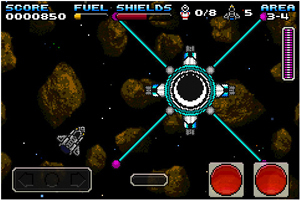 Shuttle Scuttle is a fast-paced, retro-style shooter game with a mission. It’s the year 2285 and all is peaceful since the forming of the USSA (United Sol System Alliance). That is until Neptune station reports of unidentified spacecraft approaching. A hostile force is making its way through the sol system towards earth. Armed shuttles for asteroid destruction are the only defense crafts available. Seek out and intercept this hostile force before Earth becomes a target! Shuttle Scuttle is rated 9+ on all devices for Infrequent/Mild Cartoon or Fantasy Violence. The Mac version requires Mac OS X 10.6 or later while the iOS mobile version is compatible with iPhone 3GS, iPhone 4, iPhone 4S, iPod touch (3rd & 4th generation models) and iPad devices running iOS 4.2 or later. This entry was posted on Friday, December 30th, 2011 at 9:22 am and is filed under Everyone 10+, National News, New Releases, Shooters. You can follow any responses to this entry through the RSS 2.0 feed. You can leave a response, or trackback from your own site.